The Father and the Head of the Ukrainian Greek-Catholic Church on September 15, during his staying in Bethlehem met with a group of 160 people from Ukraine who arrived to a Holy Land to pray for peace in Ukraine. The meeting was at Church of the Nativity, where participants of the Assembly of Council of European Episcopal Conference had meeting of this year. The Head of the UGCC blessed all pilgrims and asked them to pray ardently for peace in Ukraine during their pilgrimage. In the place of Christ’s Nativity they sang carols, glorifying the Son of God. 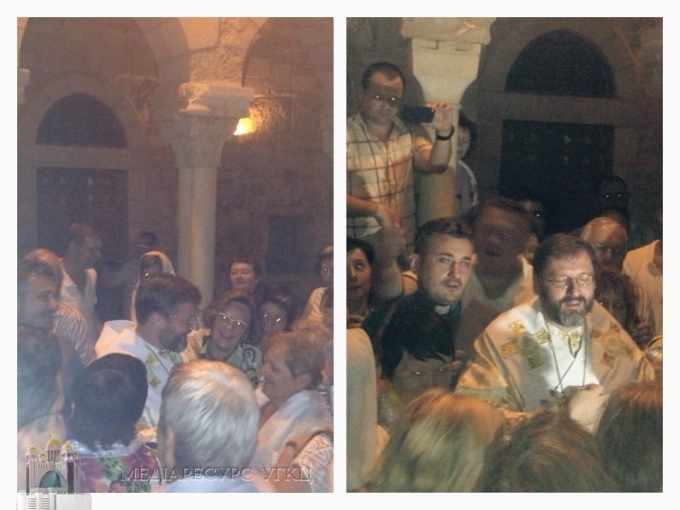 To meet His Beatitude Sviatoslav came also Ukrainians who work and live in Israel constantly. They were asking to pray for a better future of Ukrainians all over the world. The groups of pilgrims to a Holy Land from Patriarchal Pilgrimage Center were guided by father Lyubomyr Yavorskyj, father Nikanor Loik and father Igor Yatciv.